Now accepting registrations - Great Deal! CLASS LIMITED TO 14 STUDENTS. Must work in an office where ortho procedures are provided to qualify. No need to bring anything to class. All course supplies are provided. 8 Hr Infection Control for DA's or 2 hrs for RDAs: or concurrently enrolled in our COMBO course. All participants involved in the direct provision of patient care must be certified in Basic life support (BLS/CPR) including cardiopulmonary resuscitation. Red Cross or American Heart Association Only, Re-certification intervals may not exceed two years. Proof of Coronal Polish for RDA's. You may not perform coronal polish unless you are a Licensed RDA with proof of coronal polish. Proof of Liability Insurance Coverage - We have the applications if you don't have the insurance or prefer to have you're own. The OAP DA course is at least 84 hours in length and has three components: 24 hours of didactic, 28 hours of lab/preclinical, and 32 hours of clinical. The OAP RDA Course is at least 60 hours in length and has three components: 24+ hours of didactic, 26 hours of lab/preclinical, and 22 hours of clinical. There will be a 2-hour Orientation to Lab and Clinical Component Of OAP Course. The mandatory 24-hour online component must be completed before part 2 class meeting! If the online component is not completed before course date, the candidate will be dropped from the program without a refund. Will then be required to re-enroll and pay full tuition. B&P Sections 1750.2 and 1750.4 establish Orthodontic Assistant (OA) permit categories, which require completion of 12 months of work experience as a DA, completion of a board-approved OA course which may commence after 6 months of work experience, a written examination, and completion of board-approved courses in the California Dental Practice Act, infection control, and basic life support. These permits must be maintained in the same manner as other licenses, including renewal and required CE. b. Course Requirements. See IMPORTANT REQUIREMENTS ABOVE. B&P Sections 1756.1 and 1756.2 specifies that the OA course must be a minimum of 84 hours, must be board-approved. B&P Sections 1754.5, 1755, 1756.1 and 1756.2 specify the requirements that courses must meet to obtain Board approval. c. RDAs Seeking OA Permit. OA permit may be applied for before RDA licensure, or an RDA may apply for such permits post-RDA licensure. 1750.3. A person holding an orthodontic assistant permit pursuant to Section 1750.2 may perform the following duties under the direct supervision of a supervising licensed dentist: (a) All duties that a dental assistant is allowed to perform. (b) Prepare teeth for bonding, and select, preposition, and cure orthodontic brackets after they're position has been approved by the licensed dentist. (c) Remove only orthodontic brackets and attachments with removal of the bonding material by the supervising licensed dentist. (d) Size, fit, and cement orthodontic bands. (e) Remove orthodontic bands and remove excess cement from supragingival surfaces of teeth with a hand instrument. (f) Place and ligate archwires. (g) Remove excess cement with an ultrasonic scaler from supragingival surfaces of teeth undergoing orthodontic treatment. (h) Any additional duties that the board may prescribe by regulation. Prepare teeth for bonding, select, preposition, and cure orthodontic brackets after they're position has been approved by the licensed dentist. Remove orthodontic brackets, bands, attachments with the removal of the bonding material using a scaler and adhesive removing plier under the direct supervision of licensed dentist/orthodontist. 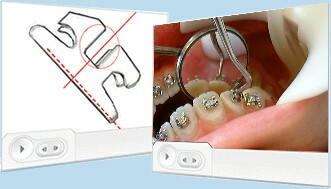 It is not legal for ortho assistants to remove orthodontic adhesive with a motorized instrument. Size, fit, and cement orthodontic bands. Remove orthodontic bands and remove excess cement from supragingival surfaces of teeth with a hand instrument or ultrasonic scaler (separate permit). Understand and apply appropriate work habits and professionalism while being employed as an orthodontic clinical assistant. Candidate must pass all required online course post-tests. A comprehensive study guide review for the State Board written an examination. Candidates must pass OAP didactic- online Final Exam and then will be eligible to advance to the OAP Lab and Clinical Course. Candidates who have successfully completed the OAP Course will then be eligible to take the OAP Exam given by the Dental Board of California. Assistants apply for they're Orthodontic Assistant Permit by submitting the OAP Course Certificate and they're OAP Exam score.